Marc Marquez secured his third world championship by winning the Japan Grand Prix Sunday where his closest rivals Yamaha duo Valentino Rossi and Jorge Lorenzo both crashed out. The 23-year-old Honda rider became the youngest man to win three premier-class world championship titles, and did so at Honda's home circuit, where he had never won before. Marquez finished the 24-lap race in 42min 34.610sec, 2.992sec ahead of Ducati's Andrea Dovizioso and 4.104sec ahead of Maverick Vinales of Suzuki. "Obviously, amazing... Amazing feeling," Marquez said immediately after his victory with a big smile, his face red with excitement. "It was difficult to concentrate," after Rossi and Lorenzo crashed out, he said. "Really happy. Really happy with my team." Marquez started second on the grid, after pole starter Rossi, who was his closest championship rival with a 52-point gap. Last season's champion Lorenzo also started from the front row. Marquez took the first corner, but was quickly overtaken by Lorenzo, who commanded the lead in the early phase of the Japan Grand Prix. 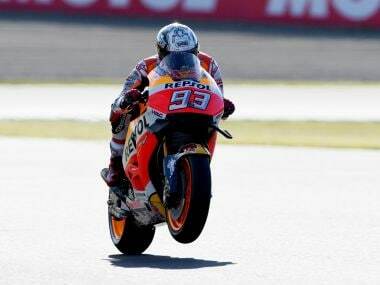 Marquez and Rossi swapped second place several times in the second lap with the Honda rider keeping the upper hand. In the fourth lap, Marquez closed in on Lorenzo to take the lead and gradually expanded the gap. With 19 laps to go, Rossi also passed Lorenzo while Marquez commanded the race. But in the following lap, Rossi slipped on the tarmac at a hair pin bend on turn 10. The Italian got up on his own, drove his bike on the track only to withdraw from the race, sending Lorenzo to go after Marquez, who was already travelling solo. With five laps remaining in the race, Lorenzo also slipped on the track, this time at the V-shaped left-handed turn nine, sending Marquez to the stunning victory.